The tutor will begin the day by demonstrating the process of photo emulsion screen printing. You will be able to choose from a variety of pre-made emulsion screens to experiment with this technique. You will also learn how to apply filler and block to screens and cut your own stencils to iron on as print designs. After lunch the tutor will show you how to mix effects and create two- and three-colour prints. 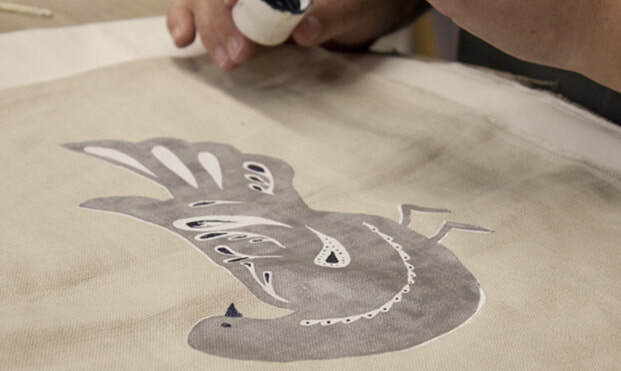 You can then choose from a variety of items to print your design onto such as shopping bags, aprons, tea towels, paper, home furnishing fabrics and greeting cards. Materials are not included in your course fee. Some materials will be provided by the tutor. The approximate cost of these will be £10–£14, payable to the tutor during the course. The items you will need to bring with you are listed below.